2018 is off to a bumpy start for the trading of large cap crypto assets. But we hold the view that pricing accuracy of $100B+ tokens isn't particularly meaningful for the technology progress in the space. It measures sentiment, which perhaps reflexively prices the market, but isn't all that helpful for figuring out what's happening in the world. On the other hand, the flow of resources -- from capital, to human, to corporate -- indicates something more real. When people choose a new way or a new product, the super structure may change. We updated our ICO and crypto fund data as of Jan 2018. The first finding is that ICO funding, which is a metric for the early stage entrepreneurship in the space (like Angel and Series A funding), is looking quite healthy. 2017 ended with $5.4B of ICO proceeds going to projects raising over $1mm+, and the one month of January already has $1.4B in flows. That doesn't include either Telegram's $1B+ planned ICO, or Overstock's $250-500mm raise, so we expect this level to continue through the year. It may be harder for an individual ICO to raise capital given higher standards and competition, so in that sense, the market is equilibriating with the Venture Capital market. Vesting schedules, performance targets and covenants are becoming standard as the early crypto funds are joined by mega venture like Andreessen. Traditional early stage investors are writing equity checks into blockchain companies, but those numbers are less than 20% of the overall equation. Coindesk makes the point that in Ethereum terms, actually the funding levels are fairly stable and not increasing. From our view, that's the whole point! The crypto Cambrian explosion was driven by capital gains in Bitcoin relative to fiat. Of course people are taking risk at the edges, using their winnings to fund more work. But there is indeed some danger that if the smart token platforms collapse in value, ICOs will have less purchasing power and thus facilitate less development. This is a real risk. 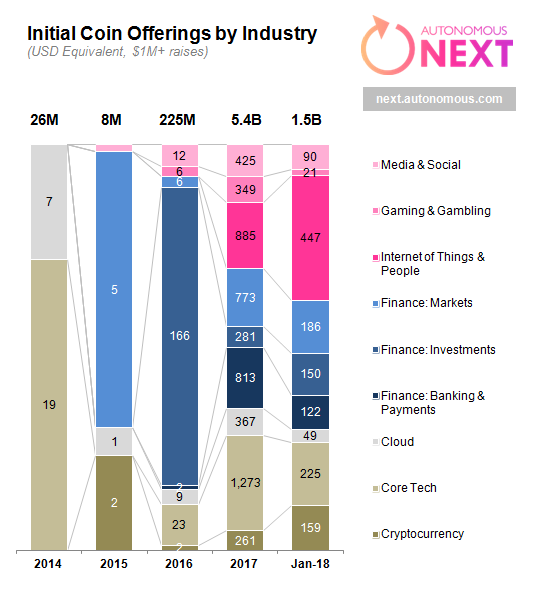 And given that an increasingly large proportion of the ICO proceeds are funding utility tokens (magenta in the graph) and fewer platforms/currencies, actual economic activity within the apps has to appear for investment value to exist. The second data point is that the number of funds continues to grow. We point to crypto capital markets volatility as a positive for the plethora of trading, quant and index funds entering the market. In total, we are tracking 225 crypto funds across 7 strategy types (hey there Salt's credit fund), and see assets in the space being between $3.5 billion and $5 billion. The diversification of strategies point to an earlier observation that crypto has collapsed all asset classes into software, putting hedge fund managers and venture investors into the same exchange. No wonder there's pandemonium. If you would like to have your fund added to the list, or to get access through an institutional subscription, please reach out here.